97% of participants rated the overall educational value of the 2018 meeting as excellent and 95% valued the meeting for learning new information. 85% said that the meeting would significantly help them to improve their clinical practice.. Particularly pleasing was that everyone attending said that this meeting gave them a greater understanding of the needs of their patients and would recommend the meeting to colleagues. 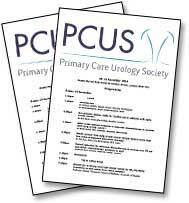 PCUS will continue its commitment to providing valued education that can help make a positive difference to delivering primary care.